254-256 Beacon are located on the north side of Beacon, between Dartmouth and Exeter, with 250 Beacon to the east and 258-260 Beacon to the west. 254 Beacon and 256 Beacon were built in 1870 for real estate developer Henry Bigelow Williams, two of five contiguous houses (252-254-256-258-260 Beacon) built for speculative sale. Click here for an index to the deeds for 254-256 Beacon. By 1908, 254 and 256 Beacon were both owned by John Howard Lee, who had acquired 254 Beacon in May of 1883 and 256 Beacon in March of 1901. The houses were inherited by John Lee’s daughters, and in 1922 they combined them into one property and converted them into apartments. On August 21, 1871, 254 Beacon was purchased from Henry Bigelow Williams by Francis L. Lee. He and his wife, Sarah Mary Ann (Wilson) Lee, made it their home. They previously had lived at 174 Beacon. They also maintained homes in Chestnut Hill and in Westport, New York. Francis Lee was a landscape architect. He had served as Colonel of the 41st Massachusetts Infantry in the Civil War. In the late 1870s and early 1880s, the Lees were living elsewhere, probably in Westport. In 1878, 254 Beacon was the home of attorney and mining investor Horatio Ripley Bigelow and his wife Anne Lenthal (Smith) Bigelow. They previously had lived at 57 Marlborough. They also maintained a home in Hanover, which they had made their sole residence by 1880. By the 1884-1885 winter season, they were living at 156 Beacon. 254 Beacon was not listed in the 1879 Blue Book. During the 1879-1880 winter season, 254 Beacon was the home coal merchant Henry Kenny Horton, Jr., and his wife, Marian Glyde (Bigelow) Horton. They previously had lived in Quincy. By the 1880-1881 season, they were living at 7 Exeter. During the 1880-1881 winter season, 254 Beacon was the home of leather dealer Walter Irving Bigelow and his wife, Harriet Staples (Christian) Bigelow. They previously had lived at the Hotel Brunswick (southeast corner of Clarendon and Boylston). By the next season, they were living at 323 Beacon. By the 1881-1882 season, the Lees had resumed living at 254 Beacon. Francis Lee died in September of 1886. Sarah Lee continued to live at 254 Beacon with their sons, Francis Wilson Lee and Thomas Lee, and their daughters, Alice Lee and Anne Wilson Lee. Francis Wilson Lee, a banker, married in September of 1890 to Marian Gliddon Dove; after their marriage, they lived in Chestnut Hill. At about the same time, Thomas Lee, formerly an investment banker, made the Lees’ Westport home his residence. Sarah Lee and her daughters continued to live at 254 Beacon during the 1890-1891 winter season, but moved soon thereafter, probably traveling abroad. During the 1891-1892 winter season, it was the home of Mr. and Mrs. Frederick Guild. During the 1892-1893 winter season, 254 Beacon was the home of attorney Richard Middlecott Saltonstall and his wife, Eleanor (Brooks) Saltonstall. They previously had lived in Chestnut Hill with his parents, Leverett and Rose Smith (Lee) Saltonstall. They subsequently moved back to Chestnut Hill to their own home. During the 1893-1894 winter season, it was the home of Guy Norman, a stockbroker, and his wife, Louisa (Palfrey) Norman. They had married in September of 1893 and 254 Beacon probably was their first home together. They had moved to 236 Beacon by 1895. By the 1894-1895 winter season, 254 Beacon was the home of merchant Benjamin Loring Young and his wife, Charlotte Wright (Hubbard) Young. They previously had lived at 357 Beacon. They also maintained a home in Weston. During the next two seasons, they were listed in the 1896 and 1897 Blue Books both at 254 Beacon and also at 393 Marlborough. 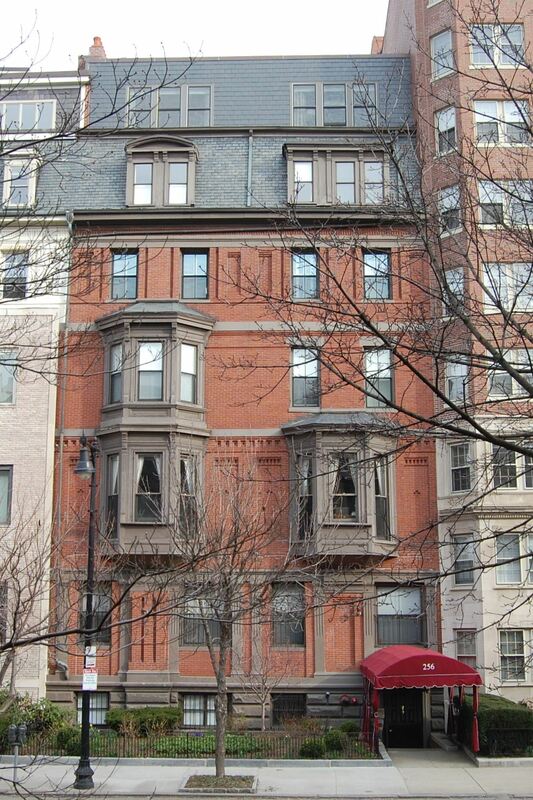 They were listed at neither in the 1898 Blue Book and by the 1898-1899 winter season, they were living at 285 Beacon. During the 1897-1898 winter season, 254 Beacon was the home of John Brooks Fenno, Jr., and his wife, Mary Hamilton (Thorndike) Fenno. They had married in April of 1897 and 254 Beacon probably was their first home together. J. Brooks Fenno was a dealer in iron and coke. By 1899, they had moved to 175 Marlborough. By the 1898-1899 winter season, 254 Beacon was the home of Dr. Charles Allen Porter and his wife, Margaret Cochrane (Dewar) Porter. They had married in April of 1898 and 254 Beacon probably was their first home together. Prior to their marriage, he had lived (and maintained his offices) at 24 Marlborough. Charles Porter was a physician and surgeon, and also was an associate professor (and later professor) at Harvard Medical School. He maintained his medical office at 254 Beacon. Sarah (Wilson) Lee died in February of 1901, and on March 7, 1901, 254 Beacon was purchased from her surviving children by John Howard Lee who lived at 256 Beacon (although they shared the same surname, John Howard Lee and Francis L. Lee were not closely related). Charles and Margaret Porter continued to live at 254 Beacon. Living with the Porters from 1900 until about 1902 was Dr. William Lord Smith, a physician. He also maintained he offices there. In 1902, he traveled Persia, where he was briefly physician to the Shah. By 1905, he lived and maintained his office at 397 Marlborough. By 1903, the Porters had been joined by Dr. William Carter Quinby, a physician, who also maintained his offices there. He continued to live with the Porters until about 1906. By 1908, he had moved to The Graffam at 330 Dartmouth. John Howard Lee died in June of 1908. In his will, he left 254 Beacon to his daughter, Evelyn (Lee) Converse, the wife of Frank Betel Converse, and 256 Beacon and his home in Royalston to his daughter, Bertha Lee. Frank and Evelyn Converse lived in Newton. He was a leather dealer. Bertha Lee lived in Royalston and then in Brookline. The Porters continued to lease 254 Beacon during the 1914-1915 winter season. June of 1915, they purchased 116 Beacon, which they remodeled significantly. They continued to live (and he to maintain his office) at 254 Beacon until the remodeling was completed and they were able to move. 254 Beacon was not listed in the 1916 Blue Book. By the 1916-1917 winter season, 254 Beacon was the home of Joseph T. Brown, Jr., and his wife, Irene Thacher (Jenney) Brown. They previously had lived in Wellesley. He was a druggist in his father’s firm and later trustee of his father’s estate. Living with them were their adult children, Martha Thacher Brown and Joseph Frank Brown, a bond salesman. The Browns continued to live at 254 Beacon during the 1921-1922 season, but moved thereafter to 1 Marlborough. By 1871, 256 Beacon had been leased from Henry Bigelow Williams by Martha Mansfield (Shepard) Silsbee, the widow of Salem merchant John Boardman Silsbee, who lived there with her three unmarried children: Arthur Boardman Silsbee, Martha Silsbee, and Thomas Silsbee. They previously had lived at 159 Beacon. She also maintained a home in Beverly. She continued to live at 256 Beacon until about 1876. By the 1878-1879 winter season, she was living at 25 Commonwealth. 256 Beacon was not listed in the 1877-1880 Blue Books. On March 31, 1879, the Massachusetts Hospital Life Insurance Company foreclosed on its mortgage to Henry Bigelow Williams and took possession of 256 Beacon. By the 1880-1881 winter season, 256 Beacon was the home of wholesale boot and shoe merchant John Howard Lee and his wife Sarah (Emmons) Lee. They also maintained homes in Brookline and in Royalston. On May 1, 1883, John Howard Lee purchased 256 Beacon from the Massachusetts Hospital Life Insurance Company. That same month, he applied for (and subsequently received) permission to build a stable at the rear of the property. In March of 1901, he acquired 254 Beacon, which he leased to others. Sarah Lee died in July of 1895. John Lee continued to live at 256 Beacon until his death in June of 1908. In his will, he left 254 Beacon to his daughter, Evelyn (Lee) Converse, the wife of Frank Betel Converse, and 256 Beacon and his home in Royalston to his daughter, Bertha Lee. 256 Beacon was not listed in the 1909 Blue Book. By the 1909-1910 winter season, 256 Beacon was the home of rubber shoe manufacturer Harry Elisha Converse and his wife Mary Caroline (Parker) Converse. Harry Converse was the second cousin of Frank Betel Converse. They previously had lived at 419 Beacon. Harry and Mary Converse continued to live at 256 Beacon during the 1911-1912 winter season, but moved soon thereafter to Jamaica Plain. In 1913, 256 Beacon was the home of Miss Edyth Deacon. During the 1912-1913 winter season, she had lived at 323 Beacon. 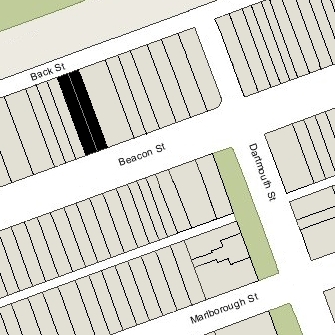 By the 1913-1914 season, Edyth Deacon had moved to 431 Beacon. 256 Beacon was not listed in the 1913-1917 Blue Books. By the 1917-1918 winter season, 256 Beacon was the home of Charles Barnard Prince and his wife, Halldis (Möller) Prince. They previously had lived at 229 Marlborough. Charles Prince was assistant treasurer of the American Tube Works, manufacturers of brass tubing. They continued to live at 256 Beacon during the 1921-1922 winter season, but moved thereafter to 190 Commonwealth. In May of 1922, Evelyn Converse filed for (and subsequently received) permission to combine 254 and 256 Beacon into one building, converting them from two single-family dwellings into five apartments. It appears likely that it was at this time that the front entrance at 256 Beacon was eliminated and the entrance at 254 Beacon was lowered to street level. The remodeling was designed by architect Harold Field Kellogg. By the 1924-1925 winter season, Bertha Lee had moved from Brookline to one of the apartments, and by the 1926-1927 season, Frank and Evelyn Converse had moved frim Newton to another of the apartments. In September of 1932, Bertha Lee applied for (and subsequently received) permission to construct a garage at the rear of 256 Beacon. Frank Converse died in November of 1936; Evelyn Converse and Bertha Lee continued to live at 254-256 Beacon during the 1936-1937 winter season, but moved thereafter. On September 14, 1937, 254-256 Beacon were purchased from Evelyn Converse and Bertha Lee by Marjorie C. O’Brien. 254-256 Beacon changed hands and was acquired on March 14, 1946, by Samuel David Weissman, a life insurance agent and underwriter. He and his wife, Frieda (Cohen) Weissman, lived in one of the apartments. Their son, Richard Merritt Weissman, who graduated from Harvard Law School in 1947, lived with them. They previously had lived at 116 Charles. In December of 1947, Richard Weissman married to Charlotte Emily Sommers. After their marriage, they lived at 15 Blossom. In June of 1949, Samuel Weissman filed for (and subsequently received) permission to convert the property from five apartments to 11 apartments. In about 1950, Richard and Charlotte Weissman moved to an apartment at 256 Beacon. By 1953, they had moved to Cambridge. In February of 1950, Samuel Weissman changed his name to Silas D. Wyman. Frieda Weissman and Richard Weissman changed their surnames at the same time. On September 1, 1950, 254-256 Beacon was acquired from Silas Wyman by the Two Fifty Six Beacon Street Company, of which he served as president. In December of 1961, it changed its named to 256 Beacon, Inc.
Silas Wyman died in April of 1961. Frieda Wyman continued to live at 256 Beacon until her death in July of 1964. On July 31, 1969, 254-256 Beacon was acquired from 256 Beacon, Inc. (Richard M. Wyman, treasurer), by Edward J. Ruel. In August of 1973, he applied for (and subsequently received) permission to remove the garage that had been added behind 256 Beacon in 1932. 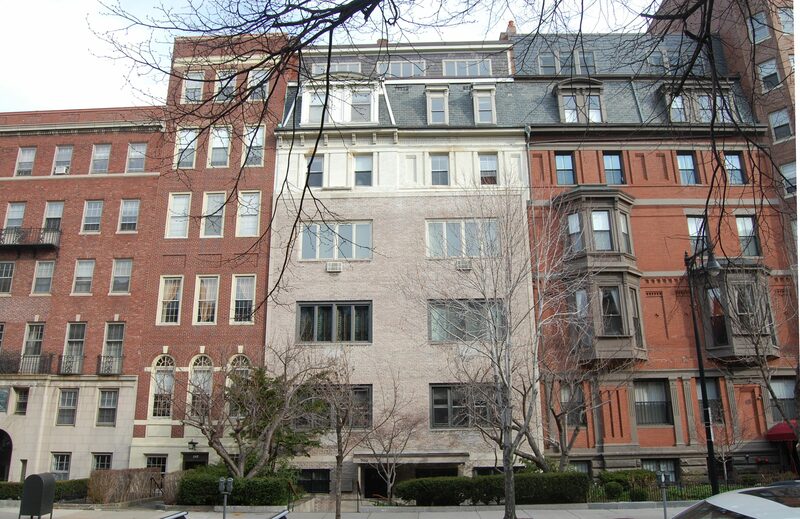 On September 20, 1976, Paul Cohen converted the property into eight condominium units, the 256 Beacon Street Condominium.